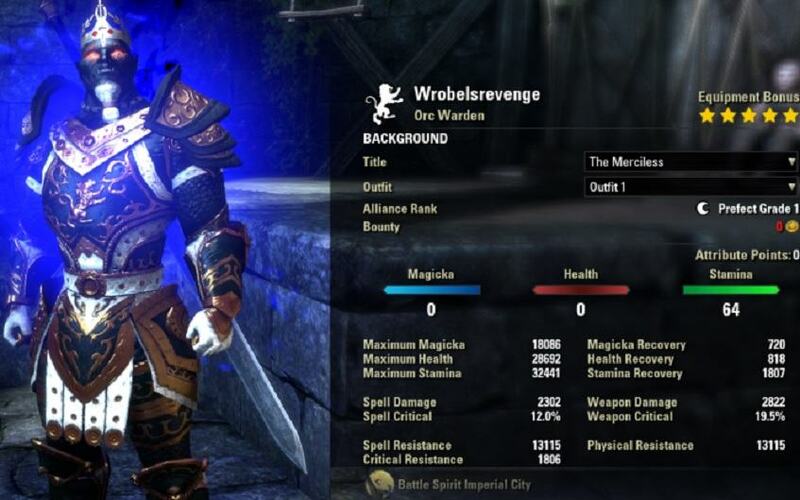 Welcome to the Stamina Warden Build PvP “Halls of Justice” by Fengrush for PvP Elder Scrolls Online. 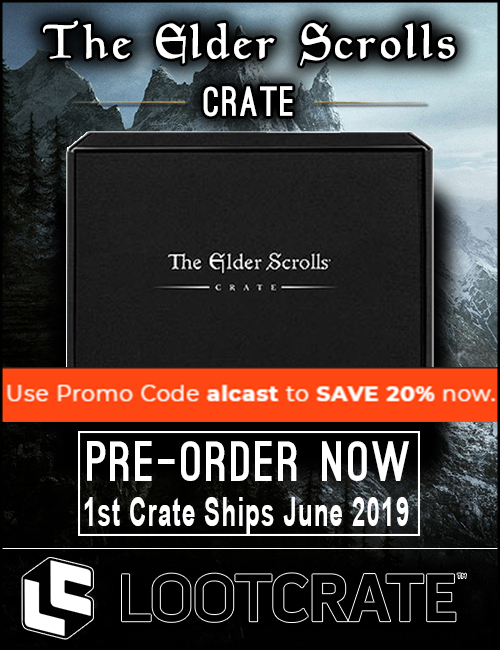 Make sure to bookmark the link as we will keep updating the build for each new Update of ESO. 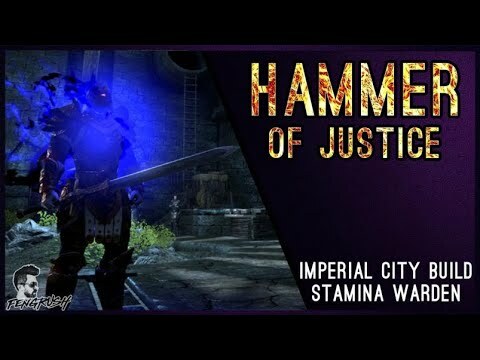 The Stamina Warden Build “Hammer of Justice” is a Medium Armor setup for Imperial City that focuses on bursting larger groups. It includes Imperial Physique which can only be used in Imperial City with Tel Var Stones. While it does require holding at least 10k+ stones, this build is very dangerous and can pay for itself very quickly. It’s a more experienced warden build as maintaining positioning and utility buffs are key to survival. There are no burst heals in the setup, but mobility and utility skills allow you to strike quickly and relocate to a safer place which can turn over-commitments from your enemy into very opportune situations in the tight hallways of Imperial City. It is paired with Vicious Death and Balorgh to allow bursting and chain reaction kills on groups that get close together. Most of the groups in Imperial City that will be farming bosses or mobs tend to clump together, and when they do not, the build has all the tools needed to bait them into an optimal situation. While it is not the strongest setup to spar in a 1v1 with, most players in Imperial City are not in optimized setups for 1v1 and will tend to have a split in PvE focused gear to farm inside Imperial City themselves. This build was added with the Wolfhunter DLC. Warden’s resource management is very good with a high uptime on ult generation. I’ve included Balorgh in the build for higher burst, but it can function without it and include The Troll King or Blood Spawn for survival as well. It doesn’t have a burst heal included in the build lineup – but an optional rotation skill on the backbar allows you to change for a variety of survival options that play to your style. Imperial City has a lot of mobs everywhere as well – so heavy attacking them for stamina between fights allows you to recover even faster and generate ult between striking larger groups. Warden burst when mastered delivers the highest AOE burst in the game right now. 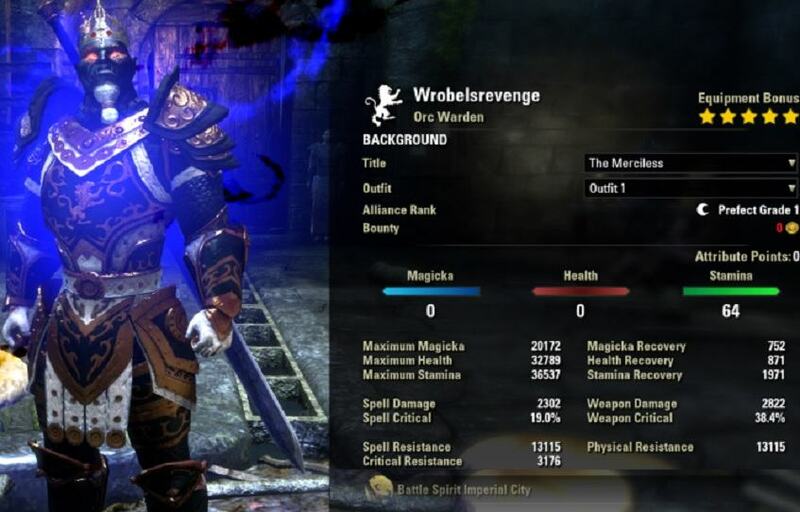 This build lines up higher survival without dropping the burst too low by using a magicka set for AOE chain reactions. High uptime on utility allows Shimmering Shield spam for defensive mitigation and constant high ultimate generation. High mobility and environment allow for line of sight and turning numbers from an advantage for your enemy into a danger. Leeching Vines, Resolving Vigor, Forward Momentum, Green Lotus and extra heal regen allow for a surplus of heals over time. Avoiding heavy burst is key. Operation around Immoveable Pots is key when striking a group that is waiting to drop multiple ultimates on you. Depending on pots you run – you can switch skills up. You can afford to run Bird of Prey, however in smaller group play you should be recasting Vigor, Shimmering Shield, Forward Momentum, and possibly Vines while retreating. If you lose Major Expedition while being chased or need to recast Bird of Prey, you may die. Otherwise, the Bird of Prey is great for the minor berserk damage. Staying alive is most important though, and keeping a proper rotation of defensives up while retreating is very important. This offers all the benefits of Dubious with health regen included without giving up anything else. This works great on orc or any other health regen benefits you can give to pair with the other heals over time you have. Sustain is key to helping stay alive. If you are able to stay on your feet and rotate Subterranean Assaults with heavy attacks you will gain resources while maintaining pressure on your target until an ult is ready to burst. There is enough damage otherwise in this build to burst the target down. In group play – you can take a more offensive Mundus Stone such as The Lover (increased Penetration). 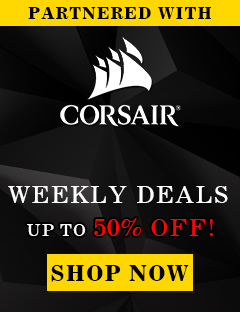 There are a variety of Potions that you can use. I recommend using the normal Immovable Potions that give you Health, Stamina and CC Immunity.